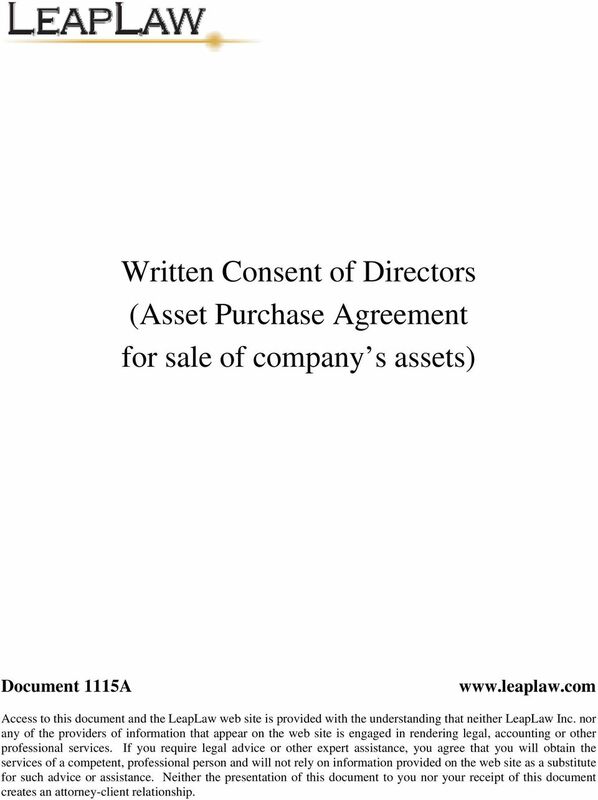 Download "Written Consent of Directors (Asset Purchase Agreement for sale of company s assets)"
1 (Asset Purchase Agreement for sale of company s assets) Document 1115A Access to this document and the LeapLaw web site is provided with the understanding that neither LeapLaw Inc. nor any of the providers of information that appear on the web site is engaged in rendering legal, accounting or other professional services. If you require legal advice or other expert assistance, you agree that you will obtain the services of a competent, professional person and will not rely on information provided on the web site as a substitute for such advice or assistance. Neither the presentation of this document to you nor your receipt of this document creates an attorney-client relationship. 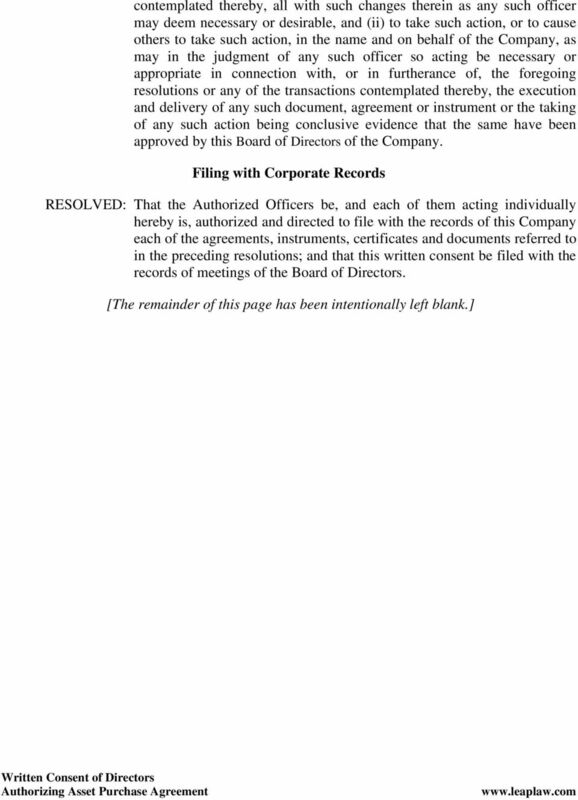 2 [NAME OF COMPANY] WRITTEN CONSENT OF THE BOARD OF DIRECTORS IN LIEU OF A SPECIAL MEETING The undersigned, being [the sole director] [all of the directors] of [NAME OF COMPANY], a [ ] corporation (the Company ), pursuant to [CITE SECTION OF STATE CORPORATION LAW] 1 hereby consent[s], approve[s] and adopt[s], as of [DATE] the following resolutions as if duly adopted at a meeting of the Board of Directors held for this purpose: WHEREAS, the undersigned deem[s] it to be advisable and in the best interests of the Company and its stockholders to enter into that certain Asset Purchase Agreement (the Agreement ) by and between the Company and [NAME OF BUYER], a [ ] corporation ( Buyer ), pursuant to which Buyer will acquire [certain assets] [all of the assets] [substantially all of the assets] of the Company; Asset Purchase Agreement RESOLVED: That the form, terms and provisions of the Agreement attached hereto as Exhibit A be, and they hereby are, ratified, confirmed and approved in all respects; and that the [TITLES OF AUTHORIZED OFFICERS] of the Company (the Authorized Officers ) be, and each of them acting singly hereby is, authorized and empowered to negotiate, execute, deliver and cause the Company to perform its obligations under the Agreement, together with such changes that the Authorized Officer executing the same may deem necessary and appropriate, the taking of any such action being conclusive evidence that the same have been approved by this Board of Directors of the Company. [RESOLVED: That the Agreement be submitted to a vote (or written consent in lieu thereof) of all the stockholders entitled to vote thereon in accordance with the certificate of incorporation and the Bylaws of the Company.] 2 General Authorization RESOLVED: That the Authorized Officers be, and each of them acting singly hereby is, authorized and empowered (i) to prepare or cause to be prepared, execute, seal and deliver or cause to be delivered, in the name and on behalf of the Company, any and all documents, agreements and instruments to effectuate the foregoing resolutions or any of the transactions 1 See appropriate state laws for drafting consents at LeapLaw s 50 State Consent Drafting Chart. 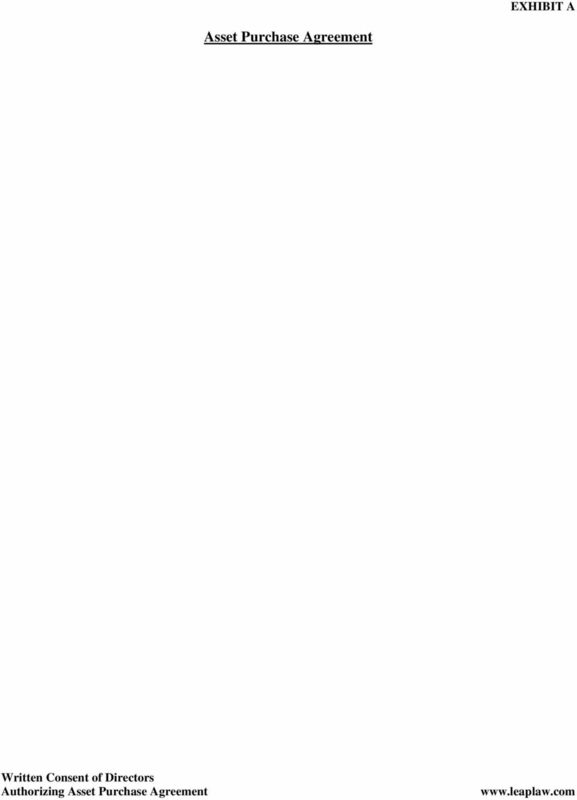 NOTE: You must be a LeapLaw subscriber in order to access these links. We offer a 30 day trial subscription. 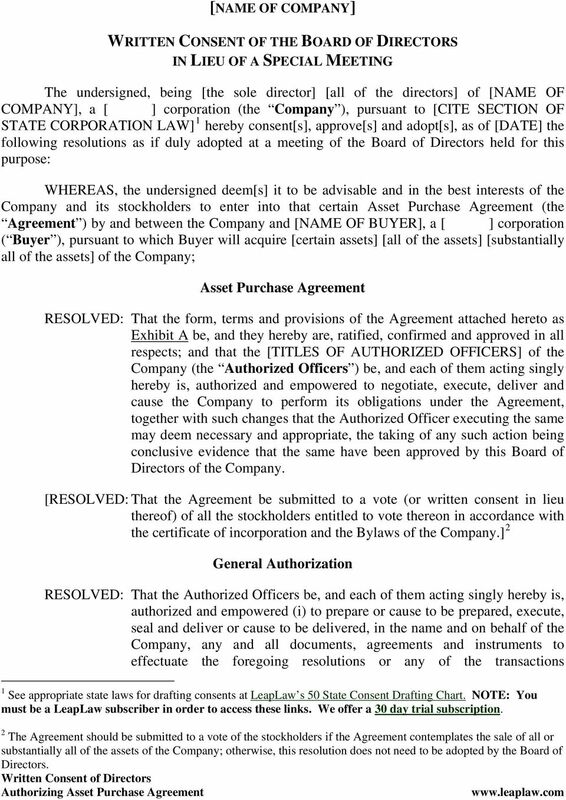 2 The Agreement should be submitted to a vote of the stockholders if the Agreement contemplates the sale of all or substantially all of the assets of the Company; otherwise, this resolution does not need to be adopted by the Board of Directors. SCHEDULE 4-3 SUBSCRIPTION AGREEMENT (CNPLP) between KEEYASK HYDRO POWER LIMITED PARTNERSHIP, - and - CREE NATION PARTNERS LIMITED PARTNERSHIP. 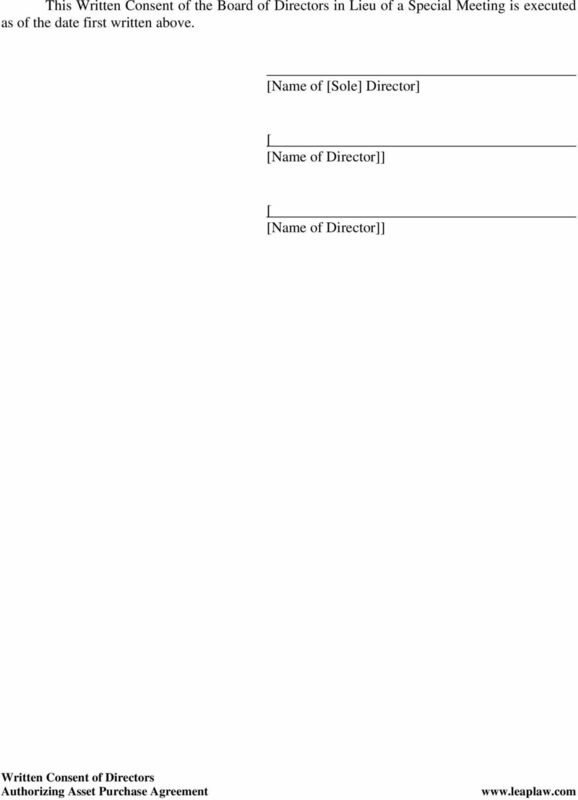 ARTCILES OF INCORPORATION OF LOGOS SCIENTIFIC, INC. It is anticipated the Finance Commission will be involved in the review of the bond financing as the specifics of the transaction develop.